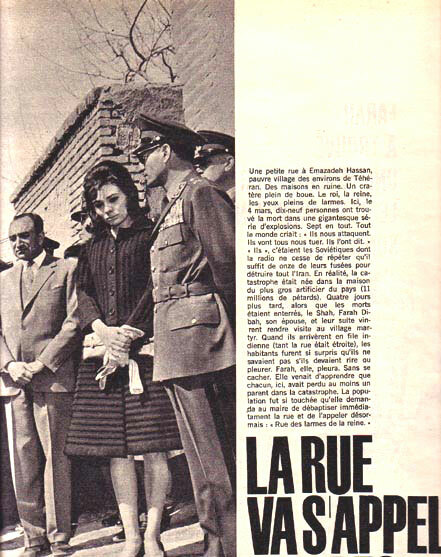 After an explosion in a street that killed 19 people in a small villiage in the outskirts of Tehran (Emamzadeh Hassan), The Shah and Empress Farah were to visit the ruins. What was first suspected as a Soviet sponsored terrorist plot was then said to be a mere accident sparked by large fireworks stocked in the neighborhood. The Empress who could not hide her tears was greeted by the tearful local villagers surprised to see her on location. The street was baptised "Ashk-hayeh Farah" aka "The Tears of Farah".